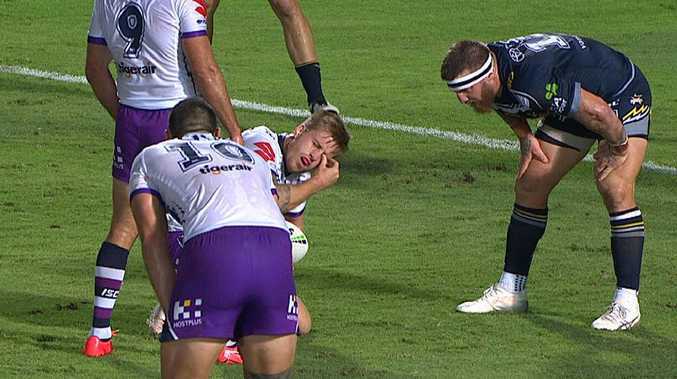 Cameron Munster reacts after allegedly being eye-gouged. 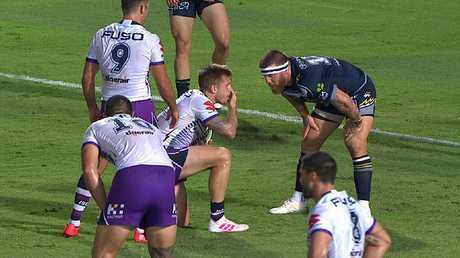 NORTH Queensland forward Josh McGuire has escaped with a fine for his alleged eye gouge on Melbourne's Cameron Munster. Munster can accept a $3350 fine for the incident in the Storm's 18-12 win in Townsville on Friday night after being hit with a grade one contrary conduct charge. 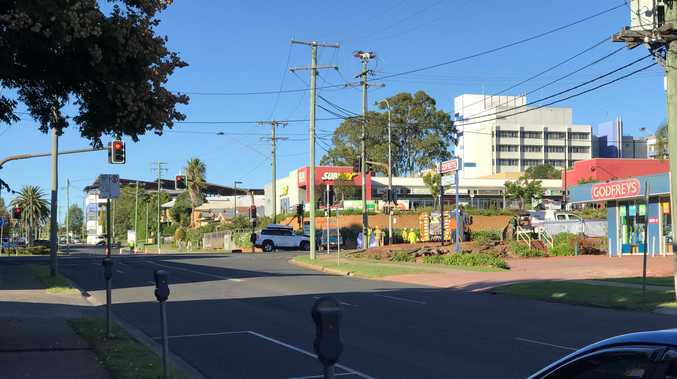 The Storm five-eighth did not make an on-field complaint despite video evidence showing his Queensland State of Origin teammate putting his fingers in his eyes. The Storm were attacking in the Cowboys' half midway through the first half when Munster was tackled 5m out from the home side's tryline. As the five-eighth rose to play the ball, McGuire's hand could be seen raking across his face. Josh McGuire allegedly eye gouges Cameron Munster. Munster stayed down and immediately pointed to his eye before shoving McGuire. When the Storm forced a goal line dropout one play later, Munster pointed at McGuire and said he'd been eye gouged. Referee Grant Atkins stopped play and asked Munster if he wanted to lodge a formal complaint. Storm skipper Cameron Smith told Munster the case "would go on further" if he did, and Munster replied "don't worry about it". Post-game Munster wouldn't be drawn into the chat. "I won't go there," he told Channel 9. "Me and Moose have a connection there. He did get me but I wasn't going to put it on report." Fox League expert Luke Lewis believed McGuire would have a case to answer once the match review committee reviewed the footage. "At first I didn't think too much of it, he might've just got up and got a poke in the eye," Lewis said. "Having a second look at it, he's definitely got his finger in the eye there and I think we're going to hear a little bit more of this during the week. It doesn't look too good." Penrith legend Greg Alexander agreed with Lewis. "He definitely has a crack at him," Alexander said. "Cam Munster obviously got up and realised it was Josh McGuire - they play for the Maroons together so he thought I won't go on with it but I don't think Cameron Munster will have much choice. "The match review committee will look at it and say he's got a case to answer."